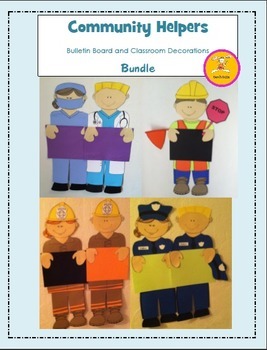 This Bulletin Board bundle of community helpers can be used to decorate your hallways, bulletin boards, or doors. Just copy on colored paper, cut, and follow directions to put together. Each figure is approximately 2 feet tall. The bundle includes doctors/ surgeons, firefighters, police, and construction worker. Designed to be multicultural depending on the color of paper used for skin tone and hair. Each character is also sold individually.